What is it? Period crime adventure starring the famous London detective. A sailor pinned to a wall with a whaling harpoon. A train mysteriously vanishing in the night. An archaeologist killed in a sauna that was locked from the inside. These are just a few of the mysteries you’ll be investigating in Crimes and Punishments, a surprisingly brilliant detective adventure with, like its hero, a very silly name. You are, naturally, Sherlock Holmes, the legendary Baker Street-dwelling detective who can suss out your entire life history with a glance. You might be wondering where the challenge lies in playing as the world’s greatest sleuth, but that’s what makes the game so great. You might have all the evidence, and it might all make sense, but you could still be wrong—and even pin the crime on the wrong person. You can move freely around each case’s setting—usually the streets of Victorian London—via a map. This is a stunning-looking game, and its environments are dizzyingly detailed. From Sherlock’s home at Baker Street and foggy railway platforms in the English countryside to ornate Roman baths and the cells of Scotland Yard, everything is rich with handcrafted detail and drenched in atmosphere. When you interrogate someone you can freeze time and study their body language and clothing, picking out clues to form questions. This shows off the insane detail of the character models and visualises Holmes’s knack for figuring someone out by just looking at them—a neat visual trick borrowed from the recent BBC reboot. Built in the Unreal engine, the game boasts ludicrously high-resolution textures and dense, cluttered levels, and as a result, weaker PCs might struggle to run it. The mouse and keyboard controls work fine, but I ended up playing with an Xbox controller. It’s a slow-burning adventure that you’ll want to sink into a chair and enjoy. Flipping between menus and moving around the world feels nicely intuitive with a gamepad—a result, no doubt, of it being simultaneously developed for PS4 and Xbox One. It’s no open world game. There are, sometimes annoyingly lengthy, loading breaks between areas. But being able to choose where and when you travel gives you a nice feeling of freedom. You’ll visit the crime scene, gather evidence, then travel back to Baker Street to conduct science experiments, or to Scotland Yard to grill a suspect. Then you might visit a dingy pub or an archaeological dig site to chase more leads. Once you’ve compiled your evidence, you can enter the ‘deduction space’, which is like peering inside Holmes’s amazing brain. Clues will usually offer two possible outcomes, and by selecting the right (or wrong) ones, they’ll connect and give you a likely conclusion—and you’ll have to decide if it’s accurate or not. This gives you some genuine agency over each case, which detective games rarely offer. Interestingly, Holmes can choose to convict or absolve who he thinks the guilty party is. Cases are self-contained, however, which means the choices you make won’t carry over into later crimes. You aren’t shaping a dynamic narrative here. It’s all about the per-case satisfaction of piecing the evidence together and choosing the right suspect. There are six in total, and each one can take a couple of hours, depending on how thorough you are. Crimes range from gruesome murders with links to the occult, to mysteries with seemingly paranormal leanings. Every case grabbed me from the very start, and I was always compelled to find the answers, which is surely the driving motivation of any good detective story. When a case is done, you can reveal if you were wrong or not, but this spoils the fun and is only worth doing after you’ve finished the game. You can go back and replay the last part of a case if you don’t like a choice you’ve made, but this feels like a bit of a cop-out and cheapens your efforts. It’s better to live with your decisions, then look back at the end and see how right, or wrong, you were. The game also compares your solutions to other players if you’re connected to the internet, Walking Dead-style. Sherlock himself is the weak link. He isn’t particularly likeable, and has a snooty self-regard that makes it difficult to empathise with him. Watson is always on hand, but is rarely useful, and feels more like an adoring fan than a right-hand man. The voice acting is decent, though, if not exactly the stuff of an HBO drama. 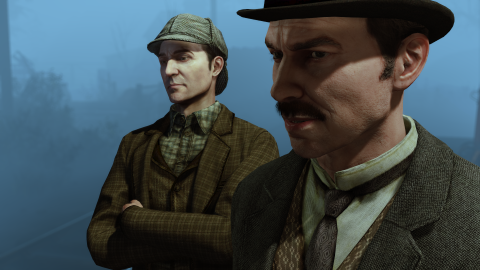 There are some colourful, well-written supporting characters in the game’s impressively large cast, but I would have liked to see a little more humanity from Holmes. The puzzles are hit-and-miss, and it’s telling that I skipped a lot of them. But it depends on what you want from the game. I was in it for the story, atmosphere, and crime-solving. But if you’re into logic puzzles and brainteasers, you’ll find an abundance of them here. It’s just nice to have the choice. If you want Crimes and Punishments to be a puzzle game, it can be. If it’s a story-led adventure game you’re after, it can be that too. Or both! This is the detective game L.A. Noire claimed to be. It doesn’t have the inflated budget of Rockstar’s game, but it makes up for its rough edges with quality detecting, compelling cases, beautiful world-building, and endearing gusto. Frogwares have been making Sherlock Holmes adventures for ten thousand years, but this is their best yet, and improves on its predecessors in almost every regard.